Woodrow Wilson writes to William Jennings Bryan about the California Alien Land Law. In view of our conversation of yesterday, I take the liberty of making the following suggestions: The more I consider the suggestions of the Ambassador from Japan, the more I feel convinced that the chief part of what he suggests is entirely reasonable. 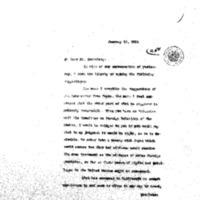 When you have an interview with the Commitee on Foreign Relations of the Senate, I would be obliged to you if you would say that in my judgment it would be right, as it is desirable, to enter into a treaty with Japan which would assure her that her citizens would receive the same treatment as the citizens of other foreign countries, so far as their personal rights and privileges in the United States might be concerned. What has occurred in California we cannot now return to and seek to alter in any way by treaty provision, but I do not see how we can justify withholding from the citizens of that great nation assurances of such treatment of their people in the United States as will not involve invidious discrimination against them. Wilson, Woodrow, 1856-1924, “Woodrow Wilson to William Jennings Bryan,” 1914 January 15, WWP18285, First Year Wilson Papers, Woodrow Wilson Presidential Library & Museum, Staunton, Virginia.